Analysis: Butker has benefited from the high-flying Kansas City offense in his first two pro seasons, ranking fourth with 142 points in 2017 and third with 137 last year. He's also exhibited accuracy, with an 89.9 percent success rate on field goals and 95.9 percent on point-after tries. Because Patrick Mahomes is under center and the skill positions are loaded with talent, Butker shouldn't have a problem upholding his standard in the fall. 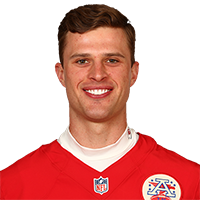 Butker made his only field-goal attempt (from 39 yards) en route to scoring seven points in Sunday's AFC Championship Game. Analysis: Butker was one of the top kickers during the regular season, and he continued his high play in the postseason. After making all 16 of his field goals from closer than 40 yards in the regular season, he went 2-for-2 in the playoffs from the same range while also hitting all eight of his extra-point attempts. Butker knocked home 24 of his 27 field-goal attempts and 65 of his 69 extra-point attempts during the 2018 season. Analysis: Butker was perfect on all of his field goals from within 40 yards, while two of his three misfires came from over 50 yards out. He did hit a bit of a snag in the middle of the season where he missed some extra points, but the second-year kicker connected on all 14 over the final four weeks. He should be one of the first kickers off the board in 2019 drafts while playing for a Chiefs squad that should feature a high-powered offense once again. Butker converted all four of his extra-point attempts Thursday against the Chargers. Analysis: Butker didn't attempt a field goal Thursday for just the second time all season and the first since Week 2 against the Steelers. He was perfect on PATs after missing one in four of the last six contests, so that's at least encouraging. He should have a good opportunity to get back on the board, in terms of field goals, in Week 16 against the Seahawks. Butker converted all three of his extra-point attempts Sunday against the Ravens, but he missed a pair of his four field-goal attempts in the contest. Analysis: Butker's misses didn't turn out to be too costly for the Chiefs, as they wound up taking home the victory in overtime regardless. The second-year kicker's return to perfection on extra-point attempts is encouraging, though he failed to come through in the clutch on a last-second field goal during the contest. He could have an opportunity to make up for it in what should be a tightly-contested Week 15 game Thursday against the Chargers. Butker knocked home both of his field-goal attempts and four of his five extra-point tries during Sunday's win over the Raiders. Analysis: While a kicker getting the volume of Butker on the weekly basis is bound to misfire on occasion, the fact that he's now missed a PAT in consecutive weeks for the second time this season and four overall is slightly concerning. Still, he's seemingly in no danger of losing his duties, and he should be owned in nearly all formats while kicking for the NFL's most prolific offense. Butker made his only field-goal attempt from 21 yards and made six of his seven extra-point attempts Monday against the Rams. Analysis: Butker was busy all night in a game that featured one of the highest scores in NFL history. 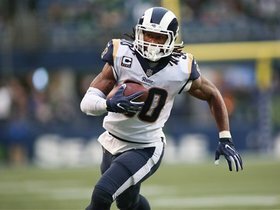 The Georgia Tech product will likely be a top fantasy option playing for one of the best offenses in the league after the Chiefs return from bye in Week 13. Butker connected on both of his field-goal attempts and his extra-point attempts Sunday against the Cardinals. Analysis: Butker settled back Sunday after missing a pair of extra points the last two weeks. He remains one of the top kicking options in fantasy playing for one of the best offenses in the league, though a tough matchup awaits the Rams in Week 11. Butker made his only field-goal attempt from 39 yards and made four of his five extra-point attempts Sunday against the Browns. Analysis: Butker has now missed wide on a pair of extra-point attempts after not missing a single one in his career prior to the two contests. Still, there's nothing to suggest the Chiefs' brass is losing faith in him, and Butker kicks for one of the more explosive offenses in the league. Butker knocked home his only field-goal attempt Sunday, but he hit only three of his four extra-point tries. Analysis: Butker was a perfect 50-for-50 on extra-point attempts entering Sunday's contest, but he failed to knock home his second try against the Broncos. He's still been one of the most consistent kickers in the league and kicks for one of the NFL's most explosive offenses, making Butker a must-own in most formats. Butker knocked home one of his two field-goal attempts Sunday against the Bengals, but he also added six successful extra-point attempts. 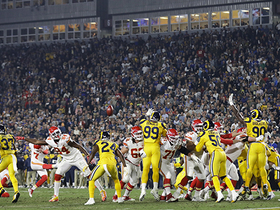 Analysis: Butker went a perfect 11-for-11 on field goals in the first six weeks of the season, but he finally misfired to the left on a field goal from 53 yards out. He's still perfect on extra points this season and should remain one of the valuable kickers in the league given the explosiveness of the Chiefs' offense. Butker connected on each of his four field-goal attempts and four extra-point attempts Sunday against the Patriots. Analysis: Butker has yet to miss either a field goal or extra point so far this campaign, going a perfect 36-for-36 on overall kicks and 11-for-11 on field goals. He should be one of the top fantasy kickers the rest of the way as part of a Chiefs team trailing just the Saints in points per game (35.8). Butker converted each of his three field-goal attempts and also made all three extra-point attempts Sunday against the Jaguars. Analysis: The Chiefs' offense was barely slowed Sunday, but a few stalled-out drives resulted in three field-goal attempts, nearly matching the four Butker had coming into Week 5. He has already attempted 22 extra points this season, nearly matching the 28 he logged over 13 games as a rookie last year. Given the explosiveness of the Chiefs' offense, more of the same should be on the way for Butker. Butker connected on both of his field-goal attempts and made all of his three extra-point attempts Monday against the Broncos. Analysis: Thanks to an explosive Chiefs offense, Butker is pacing the league in extra points made through the first four games. Unfortunately for his fantasy owners, the Kansas City offense hasn't stalled out much while in field-goal range, resulting in only four field-goal attempts over that span. That could change next week against a tough Jacksonville defense. Butker converted a 37-yard field goal on his lone attempt and made all five of his extra-point tries in Sunday's 38-27 win over the 49ers. Analysis: Butker has racked up more extra points (16) than any kicker so far, benefitting from a Chiefs offense that's been unstoppable through three weeks. Should it become less efficient, however, Butker could rack up more points through field-goal attempts, as he's been limited to two such opportunities this season. On the whole, though, his team's success has translated into a fine start. Butker did not attempt a field goal, but made all six of his extra-point tries in Sunday's 42-37 win over the Steelers. Analysis: Butker did all that was asked of him from a Kansas City offense that was highly efficient Sunday. Given how well the Chiefs have moved the ball so far this season, Butker should have plenty of scoring opportunities going forward, even if those were limited to one-point chances in Week 2. Butker knocked home all five of his extra-point attempts and his only field-goal attempt in Week 1 against the Chargers. Analysis: Butker was among the league's top kickers in terms of fantasy during the 2017 season and, if Sunday's output is any indication, he may be headed for more of the same this season. Butker nailed both of his field-goal attempts and added two extra points during Saturday's preseason game against the Bears. Analysis: Although his 2017 campaign ended with a thud in the playoffs, Butker was phenomenal as a rookie, knocking home 38 of his 42 attempts on the year with only one miss coming from fewer than 40 yards on the season. He figures to remain one of the top fantasy kickers in 2018, given the explosiveness of the Chiefs' offense. Butker, who missed a key field-goal attempt during the Chiefs' playoff loss to Tennessee, won't let the mistake bother him mentally as the 2018 season approaches, Pete Sweeney of ArrowheadPride.com reports. Butker converted each of his two field-goal attempts and all three of his extra-point attempts in Sunday's Week 17 matchup against the Broncos. Analysis: Butker thus finishes a spectacular 2017 campaign having made 38 of his 42 field-goal attempts on the year and all 28 of his extra-point tries. The rookie's contract remains intact through next season and his performance as a rookie will likely boost him up the kicker rankings heading into 2018. Butker made field goals from 31, 32, 21, 29 and 49 yards, but missed from 46 yards in Sunday's 29-13 win over the Dolphins, when he also converted both of his extra-point tries. Analysis: Butker's 17 points gave him a third straight performance in double figures, bringing his tally to eight on the whole of the campaign. Despite playing in just 12 games, he ranks sixth in scoring. Butker made three of his four field-goal attempts and all of his three extra-point tries in Saturday's 30-13 win over the Chargers. Analysis: After a couple of quiet weeks from a kicking standpoint, Butker has attempted four field goals in each of the last two contests. With a Chiefs offense that appears to have gotten back on track, Butker could have another opportunity to rack up more field goals next week against the Dolphins. Butker made field goals from 53, 29, 33 and 40 yards and also converted both of his extra-point attempts in Sunday's 26-15 win over the Raiders. Analysis: Butker's 14 total points snapped a four-game slump of single digits. Through 10 games, Butker has notched 104 points, missing only two of 30 field goals and no extra points along the way. Butker converted one of his two field-goal attempts Sunday against the Jets, adding four extra points. Analysis: Even including Sunday's miss, Butker has misfired just twice in 26 attempts overall this season. Assuming he can continue his success, the rookie placekicker will likely have a roster spot on the Chiefs and fantasy squads for the foreseeable future. Butker made his lone field-goal attempt and extra-point try en route to four points in Sunday's 16-10 loss to the Bills. Analysis: Butker started his career with double digits in four of five games, but he's combined for just 18 over his last three outings amid Kansas City's mounting offensive struggles. Butker converted all three of his field-goal attempts in Sunday's 12-9 overtime loss to the Giants. Analysis: Butker scored the entirety of Kansas City's points on a tough offensive day. After hitting double figures in four of his first five games, the rookie has totaled just 14 points over his last two outings. Butker made his lone field-goal attempt and both of his extra-point tries en route to five points in Sunday's 28-17 loss to the Cowboys. Analysis: Butker still has missed just one kick in six games since joining the Chiefs, allowing him to average a hefty 11.7 points per game, which ranks second among kickers league-wide. 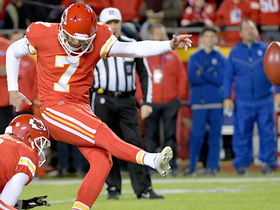 Kansas City Chiefs kicker Harrison Butker boots 54-yard field goal through the uprights. 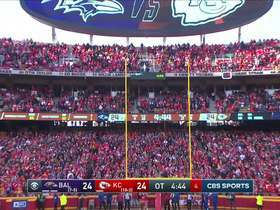 Kansas City Chiefs kicker Harrison Butker's 35-yard FG squeaks through uprights to give Chiefs lead in OT. 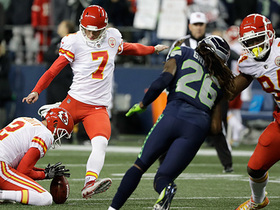 Kansas City Chiefs kicker Harrison Butker sends potential game-winning field goal wide right. Kansas City Chiefs kicker Harrison Butker misses an extra point at the end of the first half against the Los Angeles Rams in Week 11. 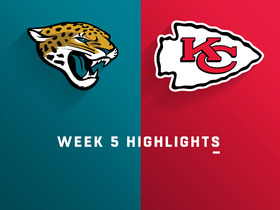 The Kansas City Chiefs defense steps up in a big spot and quarterback Patrick Mahomes runs for a touchdown in a 30-14 win over the Jacksonville Jaguars in Week 5 of NFL action. Watch the best plays from the Kansas City Chiefs and Denver Broncos Week 17 match up. 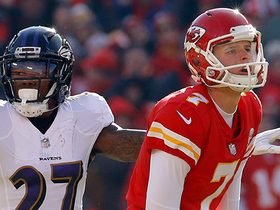 Kansas City Chiefs kicker Harrison Butker wins it on a 30-yard field goal. The "Good Morning Football" crew reveals the NFL Players of the Week for Week 16. 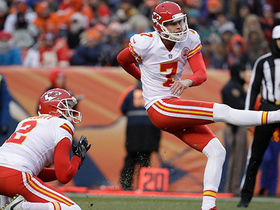 Kansas City Chiefs kicker Harrison Butker misses a 52-yard field goal. 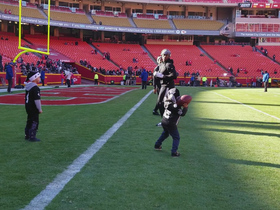 Oakland Raiders players take two young fans onto the field and play a game of catch with them before the Raiders' Week 14 game against the Kansas City Chiefs.